Hello is an exploration of one woman’s quest to share her rich inner monologue and myriad selves. A collection of two-dimensional drawings and interactive installation come together in this lighthearted exhibition. 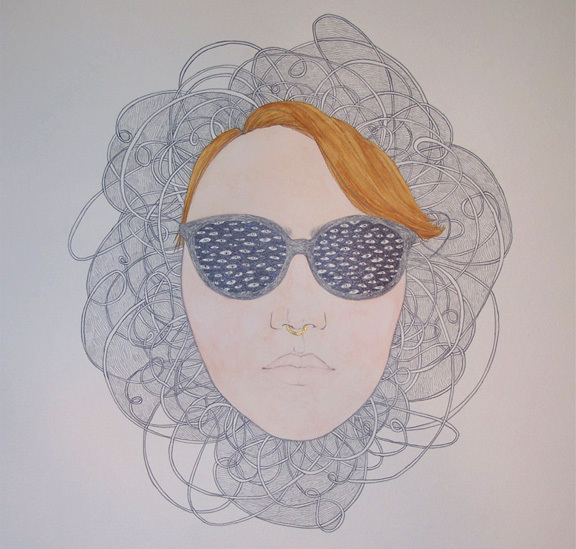 Meghan translates comedy, anxiety, and beauty into delicate line and unbounded sincerity. Inspired by zines, comics, and certain trappings of childhood this work is sure to pluck the double knotted strings in the cedar paneled basement of each grown up child’s heart. Humans spend most of their lives explaining to each other who they are and how they see the world. If these are the only eyes I’ll ever see through and this brain is the only way I’ll interpret that information then this perspective is the only one I can try to express. Each of us is the shining center of our own universe, around which float all of the important elements of our lives. Each day I wake up as a new person, a new incarnation of myself. I am all of my experiences and knowledge and feelings compacted into one goofy little package.Each day I am a little bit more than the day before. Hello brings together my many selves. Hello was funded in part by the Tacoma Arts Commission. Meghan Mitchell is an avid reader, gardener, listener, and artist. Born in Tacoma and raised in Purdy, Washington, Meghan is an alumna of the Tacoma School of the Arts and holds a Bachelor of Fine Arts Degree in printmaking from the Pacific Northwest College of Art in Portland, Oregon.